Concepts: Roll Player is a rather interesting idea for a game. Whereas many games include a process of building a character and undertaking an adventure, this game throws out going on the adventure and instead sets the player with the challenge of building the best hero that they can. The player with the best hero is the winner! Writing: This is a dice-drafting game, set in a generic fantasy world. There is not much in the way of writing outside of flavour text, all of which is atmospheric and stylistically appropriate to the game. The rulebook is very clear and lays out both the setup and turn sequences in an easy-to-follow manner, allowing the players to learn the game as they play. Mechanics: Each player begins by selecting a character sheet – a flat board with space for statistics. If you have ever played Dungeons and Dragons, you will be familiar with the stats in question; strength, dexterity and so forth. The sheets that you will be playing on correspond to a race – again, typical fantasy fare including elves, dwarves and orcs – and are double sided for male or female heroes. There is no difference between male or female characters, but there is sadly no non-binary options presented. During setup, each player is given a class, background and alignment card at random. They are also given a large handful of six-sided dice, which they roll. The dice in this game come in a variety of colours, and once rolled they are placed left-to-right into whichever of the statistic that the player chooses. The active player than distributes coin tokens to each player and places into play a number of purchasable cards from a ‘market’ deck – the market deck includes weapons, skills, traits and armour, things that you can equip to your hero. Skills can be used once each turn to alter the effect of situations, including powerful effects such as re-rolling dice, using special abilities at will, and so on. Each turn, the active player recovers a number of dice, unseen, from the dice bag and rolls them. Players then select one of the dice each and add it to their statistics. Depending on which statistic they place their dice into, they can perform a special action – swapping the positions of dice on their grid, increasing or decreasing their dice number, and so on. This adds a lot of strategy as players may be able to increase their scores significantly just by careful use of special actions. Finally, they may make purchases from the market cards, many of which will add to their final victory score. Play continues until each space on all of the player’s sheets is filled, whereupon victory points are awarded to determine the winner of the game. Design: This is a very pretty game, with all of the dice feeling good quality and the card stock used being sturdy. Some of the colours used in the sheets and cards is a little dingy and grim, which may work well for fans of darker fantasy but isn’t typically to my taste. One of our team who is visually impaired did struggle with the colour choices of some of the tokens used in the game which were not quite as sharp as they perhaps could be, and it also did take us a while to understand that the instruction manual was referring to yellow dice when it spoke of them being ‘gold’. Aside from these, there is no issues with the design of the game at all. 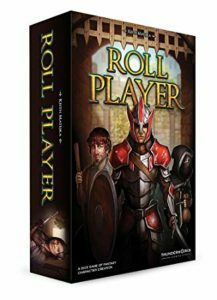 Playability: Roll Player is a fantastically playable game with a huge amount of variety. In the image to the right, you can see a completed character sheet along with both a class card and a background card. In order to gain the optimum number of points, players are challenged with trying to score the total number (or within the range of numbers) listed on their class card, and also matching the colours on their background card. Other victory stars are awarded for your alignment – this card is a 3×3 grid in which players, by placing dice into their Wisdom statistic and using its associated special ability, try to move their market into the best position. Yet more points are awarded for purchasing matching sets of armour, for completing additional goals listed on trait cards, and so on. Together, all of these elements give the players not only a huge amount of methods to gain victory, but a significant amount of challenge to overcome. 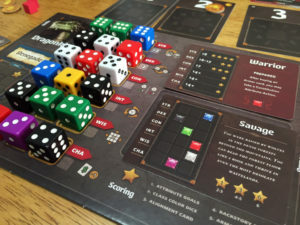 One thing that we did notice during play is that should one player roll exceptionally well during setup whilst another rolled poorly, the first will maintain something of an advantage – should all players manage middling or mixed rolls it gives for some closer matches and allows one’s strategies to more easily close any gaps. It is also possible to select traits that award victory points for scoring less in a respective skill, which certainly helps overcome this concern! Conclusion: Roll Player is a very fun game, with a nice selection of challenges for a group of adventurers. One thing that we found ourselves discussing is the potential of using the characters that were build in a Dungeons and Dragons game afterwards, so perhaps this could make a fun ‘session zero’ for your gaming groups out there. 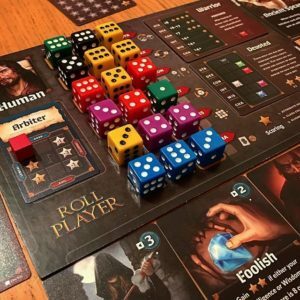 FINAL THOUGHTS: An entertaining and occasionally challenging strategic game, great for fans of non-conflict competitive gaming and budding Dungeon Masters alike.